Sometime you must do evil in order to do good. Giulio Andreotti (Toni Servillo) should be on top of the world; he's been elected Prime Minister of Italy for the seventh time, he is in a position of unrivaled power and looks like he will be able to make a run for the presidency. However, he's also overshadowed by accusations of corruption within his government, possible links to the Mafia and over 200 murders which he may or may not have been directly involved with. Il Divo is not a political biopic. This is something that needs to be stated up front since that was what I was expecting and was somewhat blindsided by the enigmatic nature of the film. On the other hand, the mere fact that I was blindsided by the film probably explains why I fell in love with it; it completely side stepped my expectations and delivered up something so much more vibrant and intoxicating than what I was expecting. So forget what I just said; it is a biopic. Except it isn't. 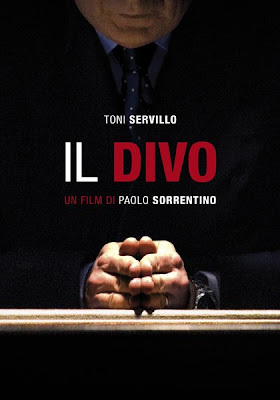 Il Divo is not a film that aims to detail the long and eventful life of Andreotti; it stays more or less in one period, the 1990s, it doesn't reveal any great details about Andreotti's life and it doesn't try to contextualise his life within the wider events in Italian politics. In fact, it doesn't really make any concessions to anyone who isn't knowledgeable about Italian politics. There is a glossary provided right at the start of the film that explains who a lot of the important groups are, but the rest of the time it speeds along and expects you to keep up, providing information either in drips or in torrents, to the extent that my head started to spin when, at one point, a character tries to relay just a handful of Andreotti's alleged crimes and criminal dealings. It's a dense and complex film that, I am freely prepared to admit, I found difficult to follow at times thanks to the sheer amount of information that I had to process. 1. I didn't really know all that much going in. 2. The film didn't go out of its way to explain much of Italian politics, a subject on which I know precisely nothing, to me. 3. The film did not explain to me who exactly Andreotti was, except in the broadest possible terms. Why then did I like it so much? Because, whilst it is not a film that tries to explain what Andreotti is in terms of the wider context of Italian politics, it is a film that tries to explain who he is, psychologically. Writer-director Paolo Sorrentino concerns himself with the man and his motivations, rather than with facts and figures. He portrays a murky, claustrophobic world of alpha male spin doctors, corrupt priests and Mafia entanglements that could give rise to a man like Andreotti who, if you believe some accounts, was responsible for hundreds of assassinations and failed assassinations during his time in office. Central to this is Toni Servillo as Andreotti, who is just mindblowing. Everything about his performance is pitch perfect for the story and themes of the film. His every gesture, the deadened way in which he delivers the majority of his lines, even the way in which he slouches when he walks speaks volumes about the character. Here is a man whose every deed is etched on his face, whose evil acts (though they may be in service of good) seep through his pores and spread over his face. There is a gargoyle-like quality to his posture and the way he scurries about the place suggests something creepy about him. The sequence where he just walks up and down a corridor is unnerving for no other reason than the way in which he walks. Whether or not you believe that he did the things that he is accused of doing, you can tell that he feels some considerable guilt over something in his past, and the fascination of the film lies in trying to figure out what it was, or if there is any guilt there in the first place. Sorrentino's direction throughout is fluid, slick and punchy. Not a single scene drags and not a single character seems out of place or expositionary. He so completely immerses the audience in this world that you very quickly lose any sense of what is right and what is wrong, at times sympathising with Andreotti, and at other times condemning him. This last point is crucial to my liking of the film, good though the style and the acting are, since the ambiguity of Andreotti and the non-partisan nature of the film leave plenty for the audience to mull over. Sorrentino provides us with both Andreotti's view of events and with the view of his accusers, seemingly favouring one but ultimately leaving enough doubt so that it is up to each audience member to determine whether or not he is a monster or a man who did terrible things in service of a greater good. In my case, I thought that he was a charming and intelligent monster who seemed to believe wholly in his cause. To paraphrase the film itself, he's either a cunning criminal or the most persecuted man in the history of Italy, and the fun lies in determining which is true.